NTP configurations should be a mandatory setting for everyone, regardless of whether we are talking about VMware products or general infrastructure software. It is just as critical as having proper DNS configured and can cause a whole slew of issues if not configured or setup properly. A question that was raised internally a couple of days back was around automating NTP configurations on the VCSA (vCenter Server Appliance) which is normally performed through the VAMI web interface as seen in the screenshot below. Instead of using the VAMI UI, the user was interested in automating it through the command-line and wondered if this was possible. This is definitely possible among other VAMI operations by leveraging the vpxd_servicecfg utility and there are a couple of options when configuring NTP on a VCSA 5.5 system. 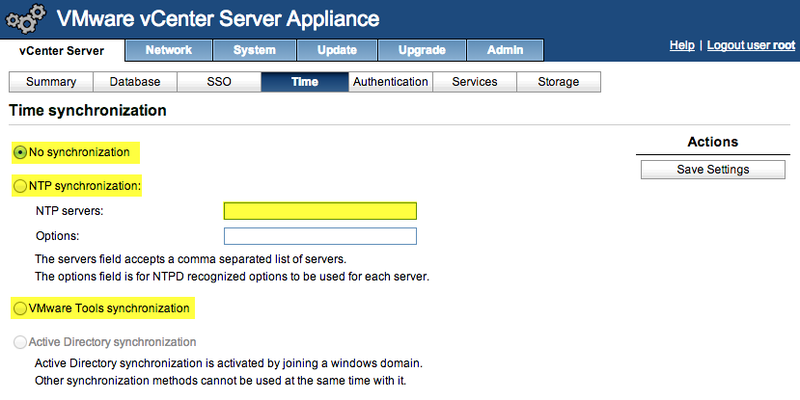 Note: If the VCSA is joined to an Active Directory domain, then the time synchronization is provided by your Active Directory server and no additional configurations are required.